The following is a guest post by Christian Moraga (@cubisteffects). If you are interested in guest posting, please contact me! DIY electronics for guitar effect pedals has become increasingly popular of late. Guitarists and musicians worldwide are downing instruments and picking up tools to build and modify their own pedals, searching for that unique tone. There are sites like Build Your Own Clone, General Guitar Gadgets and Tonepad that sell printed circuit boards (PCBs) and kits to create your own version of popular effect pedal designs. There are also websites like DIYstompboxes, Ampage, GEOFEX and AMZFX that provide a wealth of knowledge from a committed online community. However, all of this information is useless if you do not have the basic tools and techniques to enter the DIY realm. The Mod.It.Yourself (M.I.Y) blog series aims to give you those skills (plus a handful of ideas) so you too can begin deconstructing electronics to create your own personalised sound. Part 1 of the M.I.Y series is starting from the beginning – Tools and Techniques. Without these fundamentals, you will no doubt be left with damaged parts, boards and burnt finger tips. So safety first! Be sure to work in a well-ventilated, well lit work area with a clear work space to avoid burning anything as a soldering iron can reach 900 degrees (480°C). Soldering produces fumes so ventilation is a must and safety glasses/goggles are also recommended as stray metal is known to fly around an electronics work space. 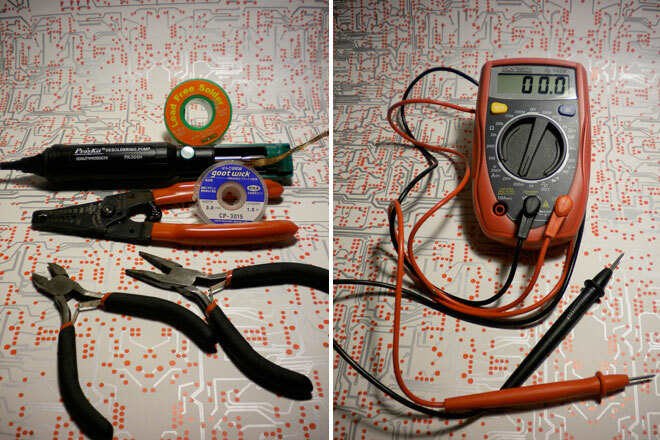 To build/modify any electronics you will need to have tools for soldering. Soldering is the melting of metal to join two components to form a conductive connection (solder joint), so you will need solder and a soldering iron to create this connection. Soldering irons come in many forms but a 40W iron is best to provide adequate heat transfer and solder flow. Solder comes in different compositions, with different types of metal. Leaded solder flows best but has toxic fumes so try and use lead free solder. There are other tools required for building/modifying guitar pedals; long-nose pliers, side cutters (or snips), multimeter and wire strippers (as pictured). These tools will help in populating boards, cutting away component legs, checking proper connections and stripping insulated wire. Now that we have the tools, let’s get to soldering technique. (1) It is important to place the iron where the component passes through the board. Heat this spot for a second. (2) Apply the solder to this spot. Keep applying solder until a dome forms up the component leg (two seconds). (3) Remove strand of solder while maintaining iron on spot. This allows the solder to flow through the PCB hole (one second). (4) Finally, remove iron from spot. Cut off the remaining component leg and you should now have a shiny, solid solder joint. But mistakes do happen, and a technique as important as soldering is desoldering, the process of removing solder from a joint. This skill is a must in electronics for removing components from a board, correcting a bad (or cold) solder joint etc. A desoldering pump and desoldering wick or braid (as pictured) are just as valuable as a soldering iron and are must haves in your toolbox. This video from Make Magazine runs through a few desoldering methods, as well as a brief soldering demonstration and is well worth watching. Christian Moraga is the owner of CubistEffects.com located in Sydney, Australia. Christian repairs and mods most brands of pedals like BOSS, Ibanez, EHX , Arion, MXR, Danelectro, Marshall, Dunlop, VooDoo Labs, Digitech, DOD etc and specialise in Big Muffs and ProCo Rats. He also makes custom switching and loopers for your pedalboard needs. A/B, True Bypass, Tap Tempo etc. I found Christian while doing some research on the Line 6 DL4, where Christian had some great mods available! Common mistake: solder fumes are NOT lead vapor, they are flux vapor. Lead vaporizes at 3000deg F, and your soldering iron will never get anywhere near that hot! Flux fumes are still harmful though – lead-free stuff may even be worse. Right you are Jonathan. Thanks for picking that up! Good link too. I think I desolder almost more than I solder! haha I go through a lot of pcb’s but hey, a hobby’s a hobby! Thank you for the tips, let’s see if I can improve my technique!